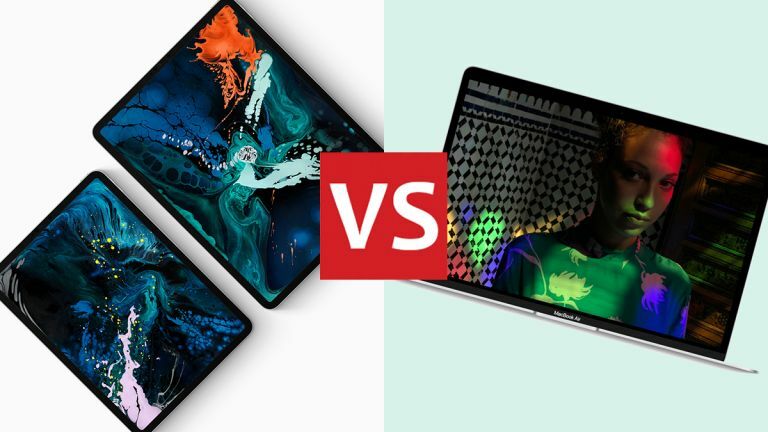 iPad Pro vs MacBook Air 2018 edition: which new Apple device is best for you? For fans of new Apple hardware, 2018 has been quite a year – and among all the other launches, we've seen a new MacBook Air and a couple of new iPad Pros unveiled. Which begs the question: which of these shiny, sleek new devices is the best purchase for you? Well, we're about to help you decide – we'll match the 2018 MacBook Air against the 2018 iPad Pros, explain all the differences you need to know about, and help you come to an informed decision. When you're spending this much money, you want to have all the facts. The iPad Pros get quite a dramatic redesign this year: the home button disappears, the bezels get shrunk, and there's a flatter, more uniform design that does away with the chamfered edges. The two screen sizes you've got to pick from are 11 inches and 12.9 inches, and the tablets are just 5.9 mm (0.23 inches) thick – though that goes up if you add a Smart Keyboard Folio, of course. As for the new MacBook Air, the design hasn't changed massively from the MacBook Air we all know and love. The big upgrade is the 13.3-inch display, now at a Retina resolution with a total of four million pixels. The new keyboard and large trackpad found on other MacBook models is here now, and when closed the laptop is 15.6 mm (0.61 inches) thick. When it comes to comparing one against the other though, the biggest consideration is that one's a tablet (with an optional snap-on keyboard) and one's a laptop. If you need touchscreen support and a tablet mode, for greater portability, choose the iPad Pro; if above all you need something you're actually going to be able to type on for extended periods of time, the MacBook Air might be better. The A12X Bionic chip inside the iPad Pros (together with 4GB or 6GB of RAM) equals blistering performance – this is a seriously fast tablet and indeed gives many laptops (including the MacBook Air) a run for their money. The iPad Pros are running a more lightweight OS than full laptops are, but nevertheless these are two of the most powerful devices you can buy in 2018. In terms of storage, you can pick from 64GB, 256GB, or 512GB of on-board storage. As for the MacBook Air, you've got a respectable 8th-generation Intel Core i5 processor, up to 16GB of RAM, and up to 1.5TB of storage (three times the limit on the iPad Pros). That should be enough to take care of almost anything you want to throw at the laptop, though intensive video editing and other demanding tasks will cause a slowdown. We're not really comparing apples to apples with these two bits of Apple kit in terms of their specs, because they're not the same type of device, but the iPad Pro just edges as far as performance levels go. If you need more storage though, as well as access to desktop rather than mobile apps, the MacBook Air begins to look like the better option – even if it's not quite as fast. This is where the real differences emerge: the iPad Pro is, as you may have noticed, a tablet. That means it runs iOS, and the mobile version of Safari (and other web browsers), so you're relying on mobile apps and games rather than the desktop versions you can install on the MacBook Air. To take just one example – Microsoft Word is available for both iOS and macOS, but the desktop version is a lot easier to use and a lot more capable too. On the other hand, the iPad Pro might be a better bet for just chilling out and watching Netflix, without that big keyboard getting in the way. It really comes down to what you're going to be using the device for when you get it. The iPad Pro works with the new Apple Pencil, so is perhaps better for more creative types, whereas the MacBook Air gives you the benefit of better expandability – hooking up external disk drives and the like. Finally, both devices have a front-facing camera for video calls, but only the iPad Pro has a rear-facing camera too. Both of these new Apple devices are sleek and powerful, but they're suited for quite different jobs: if you're deciding whether you can do all your computing on an iPad Pro or need a full laptop like the MacBook Air, then you really need to consider which apps you want to use, and what you want to be able to do on the web. Price is a factor too of course – though if you're wanting to use the iPad Pro as a laptop replacement, remember the extra £179/$179 for the Smart Keyboard Folio, which makes prices more or less level across the board (check the widgets on this page for the latest deals). Go for the big iPad Pro with all the trimmings, and you can end up paying a lot more than you would for the top-end MacBook Air. We like both of these devices a lot but they're built for different purposes. What might put you off the iPad Pro, if you're going down the tablet route, is that the £319/$329 does just about all the same stuff as the iPad Pros do at a fraction of the price – you're really just paying for more power that you might not use and a more stylish design. For a full comparison of Apple's 2018 tablets, check out our guide here.